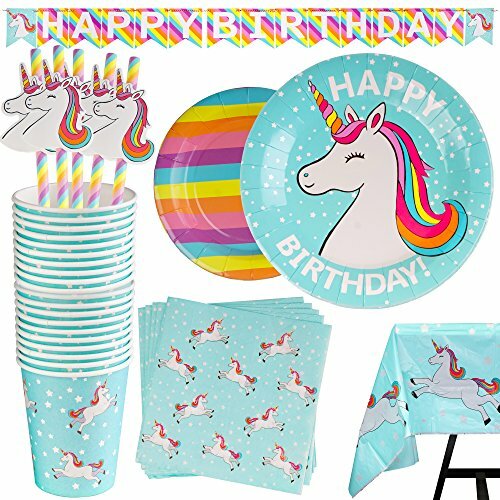 102 Piece Rainbow Unicorn Birthday Party Supplies - Including Custom Plates, Banner, Cups, Napkins, and Tablecloth, Straws, Serves 20. Material: Durable, Thick Paper. Tablecloth made from durable plastic. NOTE: Don't put anything too heavy on it. Better to hold plates with 2 hands so its more sturdy. UNICORN CRAZY - Amazing for all unicorn fans - Impress and wow your guests and friends with the unicorn themed party set. This set is a better choice as it comes in a pack that serves 20 guests and you could clearly see what you are getting. PERFECT, COLORFUL DECORATION - These party supplies are great for a unicorn-themed birthday party. The tableware designs are cute, colorful and fun. HIGH QUALITY - Designed for 1 time use. This unicorn party pack set is made from solid, durable paper material. Great for desserts, party food and beverages. If you have any questions about this product by Scale Rank, contact us by completing and submitting the form below. If you are looking for a specif part number, please include it with your message.